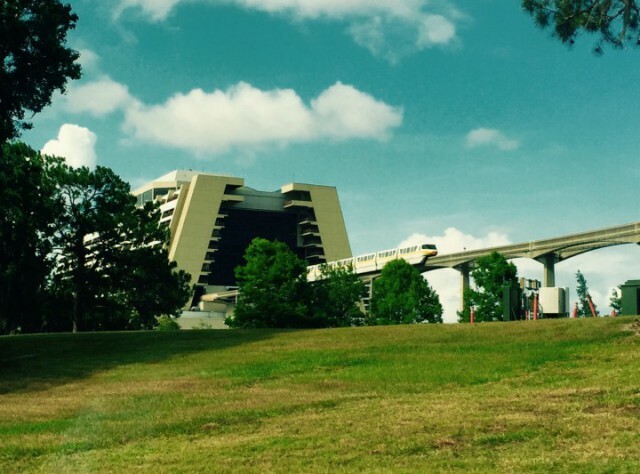 monorail | It's "All in WDW"
UNSUBSTANTIATED Rumor Reaction: WDW’s Monorail System! Good Saturday, my friends! Welcome to “Rumor Reaction”. Today’s topic? WDW’s monorail system, of course. Oh, we’ve all seen the report, I’m sure. Well, unless you’ve detached yourself from social media for the last few days, that is. 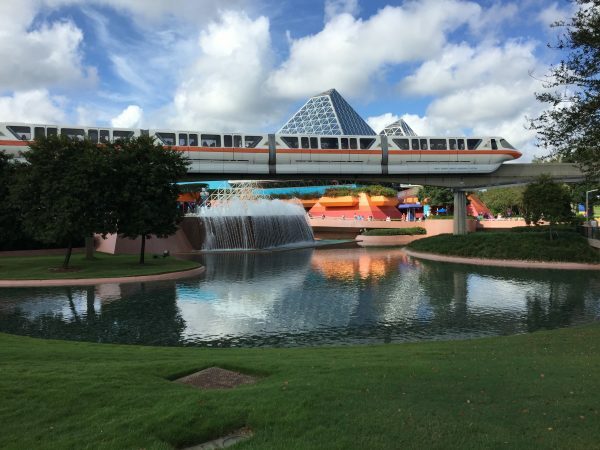 Spurred by the monorail’s recent open-doored journey across property to Epcot, one theme-park focused web site has posted a rumor that Disney is reviewing the future of WDW’s monorail system. Why, you ask? High maintenance and upgrade costs, evidently. Hey! Who here hasn’t complained about the monorail’s intermittent service issues? It is old equipment, after all. If you haven’t seen it, here’s the link to a report out of WPLG Local 10 (Miami) News. In it, Disney categorically refutes the rumor while claiming “there are no plans to discontinue the system”. On the other hand, the original blog post maintains that they’ve been hearing quiet whispers of the monorail’s demise. In addition, allegedly, it is reported that one source (not specified as a Disney source, by the way) contends that age, reliability, downtime, and maintenance costs make some form of closure plan a necessity. Hmm. 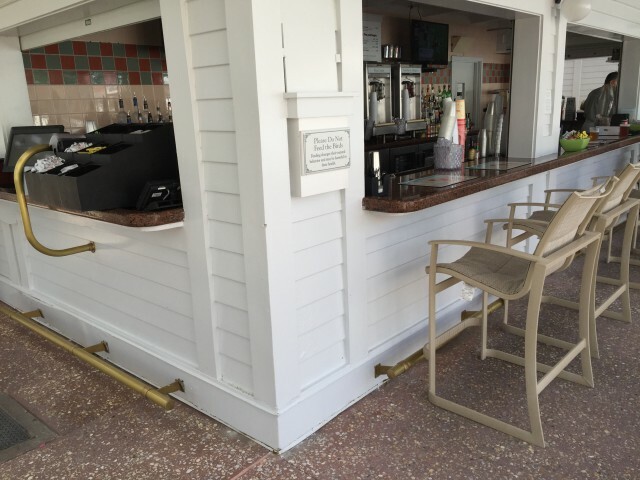 Disney is transforming just about every square inch of Walt Disney World property. The monorail is old and prone to bouts of unreliable service. The cost of maintaining the entire system has to be substantial. 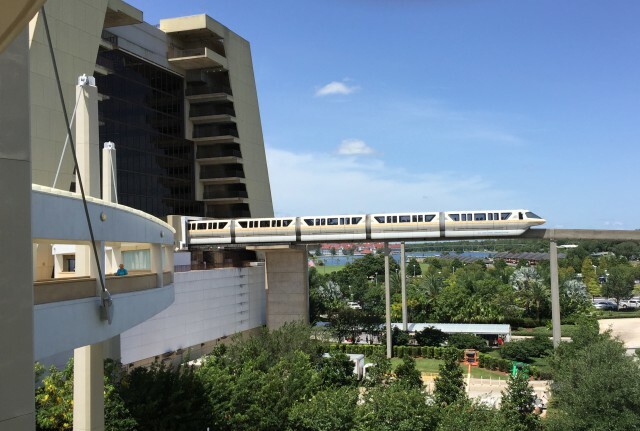 Regardless of their denial, could Disney aim their “guns” at WDW’s monorail system in the near or distant future? What do you think, folks? Please leave your reactions in the comments on this post or on Facebook, Twitter, or Reddit. Then, register your “votes” in the poll below. Do you expect that this speculation is true or false? Good morning, my friends! How have you been the last few days? I had to step away for a bit to “rest and recharge”, but I’m back, and I’m ready for breakfast! “Standard Disney fare”. You hear me say that a lot. You hear other bloggers and podcasters say that a lot, as well. When it comes to breakfast at most (or all?) WDW locales, however, that’s pretty much the norm. That’s OK, though. We all love our Mickey waffles, right? Anyway, Gasparilla Island Grill at Disney’s Grand Floridian Resort & Spa is one of those, aforementioned, Disney restaurants. But, it’s “different”. In fact, it stands just a bit above the rest. Why? Well, it’s open 24/7, folks! Yes, you heard me. Gasparilla is a bona fide “open all day” Disney Counter Service! It does, indeed, serve pretty standard fare, of course, but, hey! Where else in WDW are you going to get a decent, hot, cooked midnight snack?! 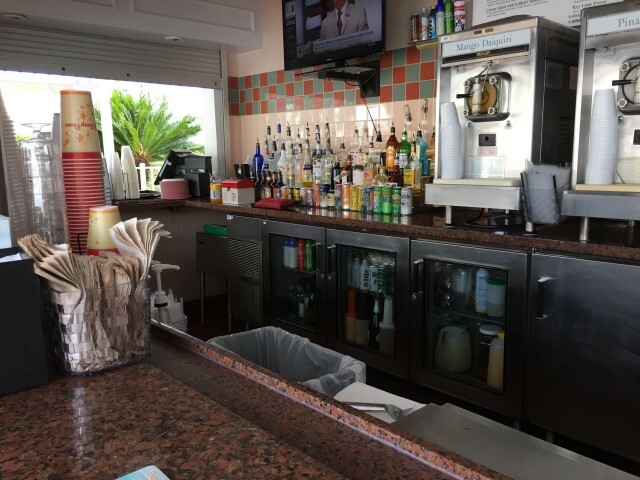 Yes, my friends, whether it’s a visit to grab breakfast, lunch, dinner, or an “after hours” bite, this Quick Service is a fantastic stop! Take a look and enjoy! Like everything else at the Grand Floridian, Gasparilla’s exterior appearance is clean and pristine. Beautiful day? GREAT outdoor seating! The interior is pretty simple. Nothing fancy, that is. The place CAN get quite busy, that’s for sure! There it is! “Standard Disney Fare”. I decided to enjoy the Croissant Sandwich. It was a bit dry, to be truthful. The hash brown was a side purchased separately. 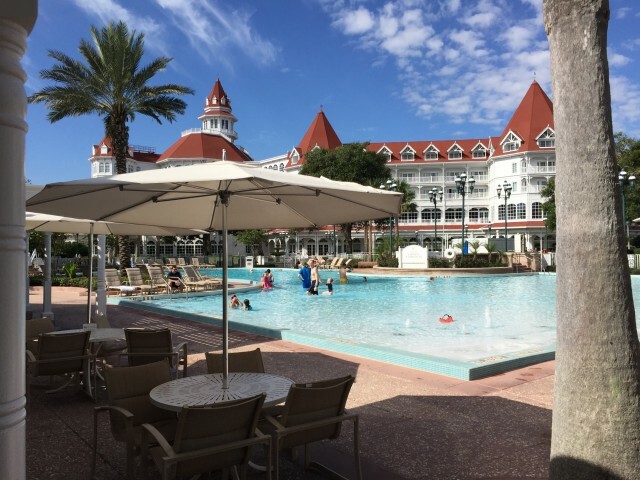 A Poolside Lunch at Disney’s Grand Floridian Resort & Spa! 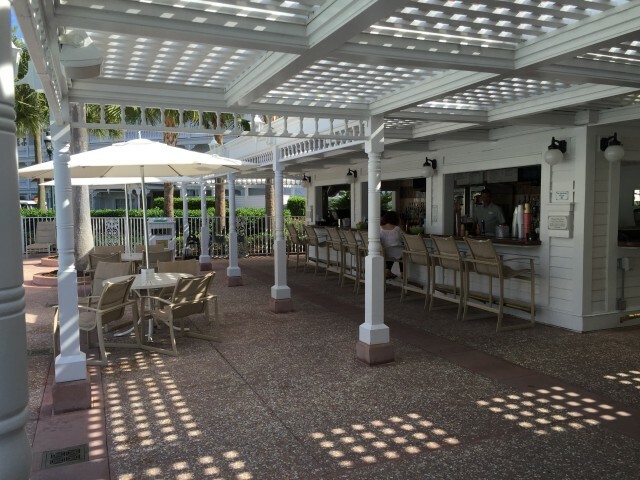 Located alongside what is simply named the Courtyard Pool, this Grand Floridian pool bar, sports an incredibly obvious name – Courtyard Pool Bar. Gotta love the creativity there, eh? Just kidding, Disney! It’s also a very relaxing setting in which to take on a light lunch. The menu is pretty limited, I’m afraid. Having said that, Mrs. All in WDW and I were able to find something to share! 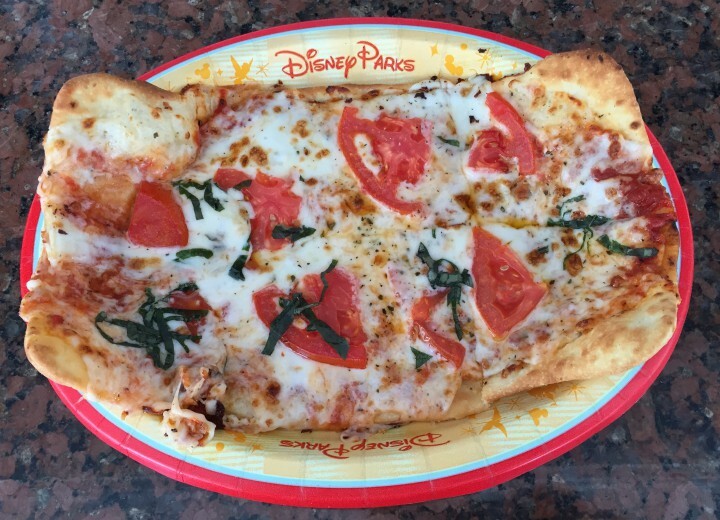 Served by the Floridian’s Quick Service – Gasparilla Island Grill – this Margherita Flatbread was a tasty collaboration of mozzarella, tomato, and basil. 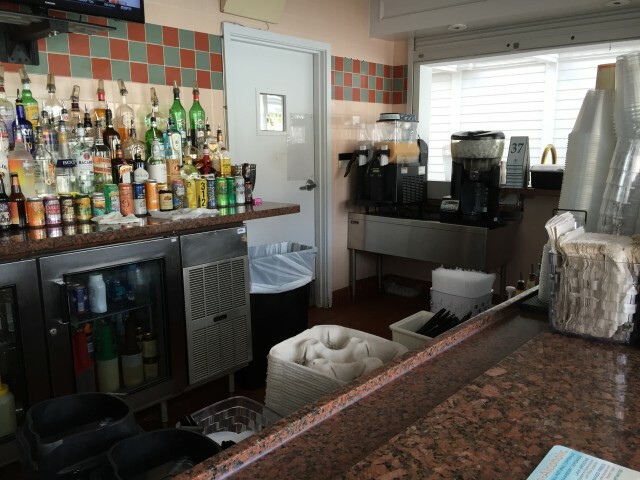 All in all, maybe this pool bar wouldn’t be the first place you’d think of for a meal, but it’s a pleasant place, nonetheless. Hey! If you’re visiting the Grand Floridian, stop on by! One of All in WDW’s readers recently asked me, “Bob, do you eat at every place you publish?” Uh, the answer to that is, unequivocally, no. I couldn’t really justify the expense … or eat that much food! You’ve noticed, I’m sure, that sometimes I merely post a menu. Maybe I’ll even add a couple of shots displaying an eatery’s setting, theming, and decor. If I do just that, then we haven’t taken the time to stop and eat. It could be that we’ve just dined elsewhere. It could be that we’re passing by, for example, at breakfast and we’re saving room for the lunch that we plan to have a few hours hence. Whatever it is, it doesn’t mean that the location’s food isn’t good. It just means that we’ll have to stop back sometime in the future. My goal is to present the restaurant to you … whether or not I add pictures of their cuisine. 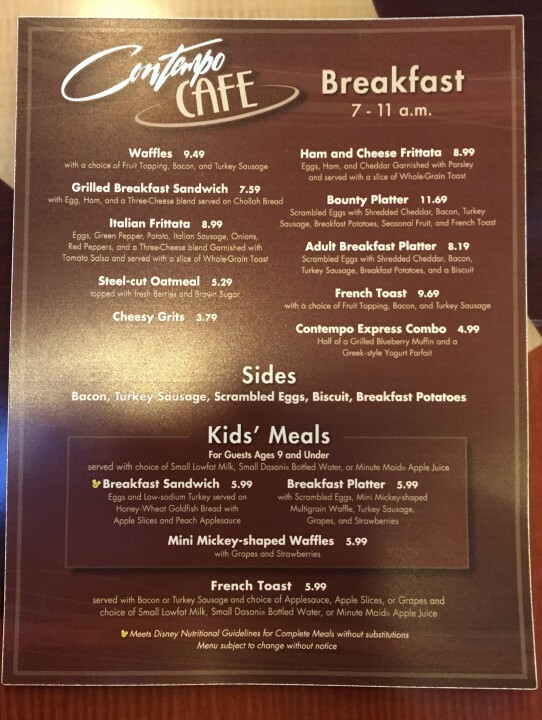 … you’ll find their Quick Service option – Contempo Cafe! 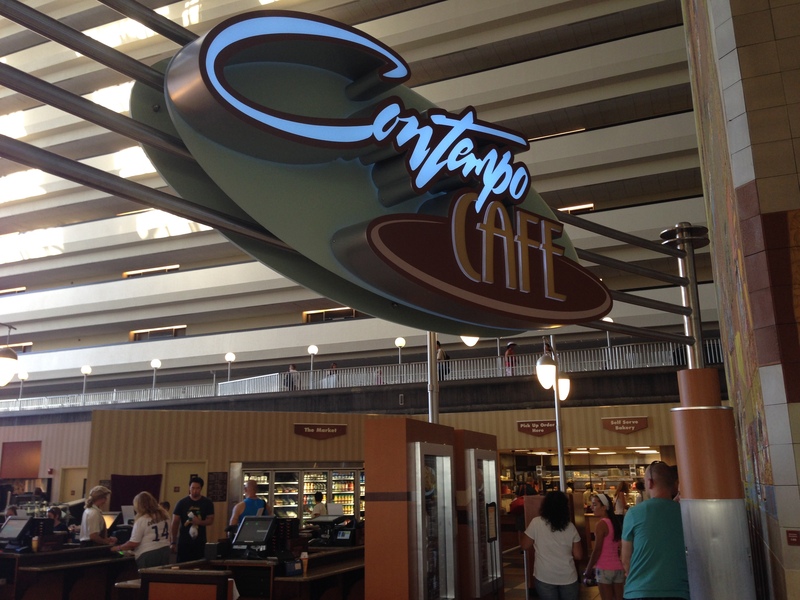 Contempo Cafe is one of the places at which the All in WDW family has never dined, I have to admit. It just never seemed to be the right place or the right time. Having said that, it’s on our list for a future visit. The best way to describe Contempo, from my perspective is ‘standard Disney fare’. Having said that, it is a popular spot, and it sports an intriguing breakfast menu. Have a look! What about you? 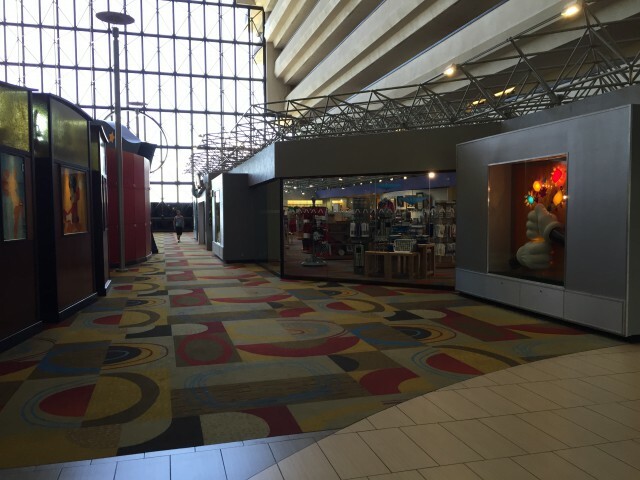 Have you been to the Contempo Cafe? What are its highlights? What are your concerns? Let us all know! Great work, fans! Yes … yesterday’s Disney masterpiece can be found in a shop window on the main concourse floor of Disney’s Contemporary Resort! You know, I didn’t notice it until I actually wrote Sunday’s post, but, for those that didn’t catch it, go back and look into the reflection on the glass in that picture. Other than one poorly placed photographer – stand somewhere else next time, Bob! 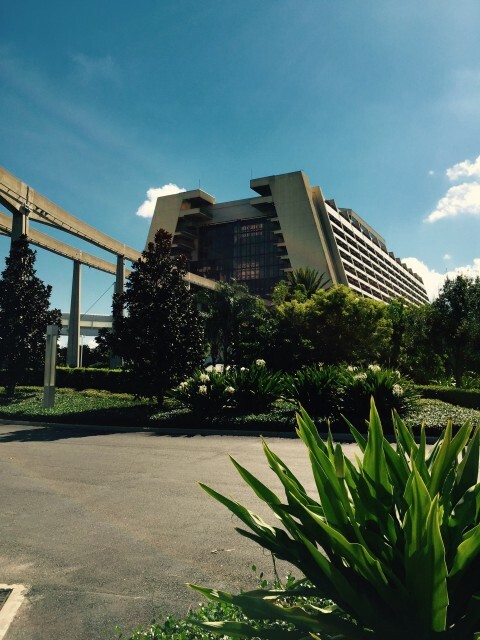 – you can clearly see the Contemporary’s unique architecture near the top of the shot! All in WDW needs a much better photographer, I think. Or, do we? I really like this one! Taken from the bridge between Bay Lake Tower and its sister resort, this was one well-timed catch! Boy, I love that monorail! Have a great Monday, folks! Remember, Round 2 of the 2015 WDW Fantasy Parks Draft will be released by the WDW Main Street Podcast this coming Wednesday!